This is a continuation of my Abu Dhabi review series. Other articles in this series cover the Hilton London Heathrow Terminal 4 hotel, the Etihad lounge in Heathrow Terminal 4, the Jumeirah At Etihad Towers hotel in Abu Dhabi, the Etihad Premium Lounge in Abu Dhabi and the First Class Suite on the Boeing 777. 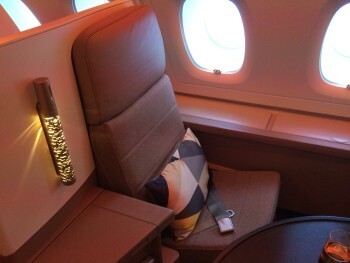 This article is my review of the Business Class Studio aboard the new Etihad A380 aircraft. London was the launch route for the Etihad A380. When I flew it in late January, the aircraft had only been in service for a month and was as pristine as you can get. Etihad has gone for a traditional layout with First Class and Pearl Business Class on the upper deck and Coral Economy Class on the lower deck. Unlike Emirates, you cannot board from the lounge at Heathrow. Etihad uses Gate 10 in Terminal 4 which is directly opposite the lift to the lounge. 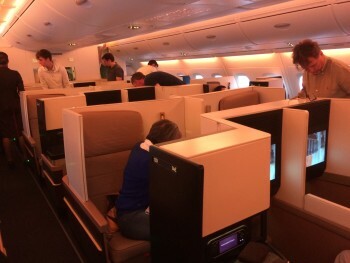 There are 70 seats in Pearl Business Class on an A380. For comparison, Etihad’s Boeing 777’s only have 40 seats. Business Class was less than 50% full but this could have been done on purpose – if the one and only A380 had teething problems, Etihad would have had to substitute a smaller aircraft. I was sat directly on the wing. 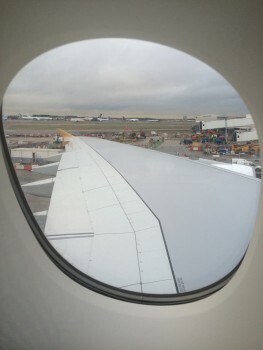 And, being an A380, it is a BIG wing! The layout is interesting with shades of the British Airways yin / yang approach. Take a look at the picture below. In the middle block, you can either a) face forward but sit very close to the person in the adjacent seat – albeit you can put up a screen divider – or b) face backwards but have a substantial amount of space between you and the other passenger. If you sit on the left or right hand side, you can either a) have a window seat and face forward or b) have an aisle seat and face backwards. Note that – unlike British Airways – every passenger has direct aisle access without needing to step over anyone else. I had seen the ‘Business Studio’ seat at World Travel Market back in November so it wasn’t a complete surprise. As well as the A380, this seat is also being installed on the new Boeing 787 fleet. Here is my seat – which extends into an 80 inch bed if required – and a view looking forward towards the huge 18 inch TV. 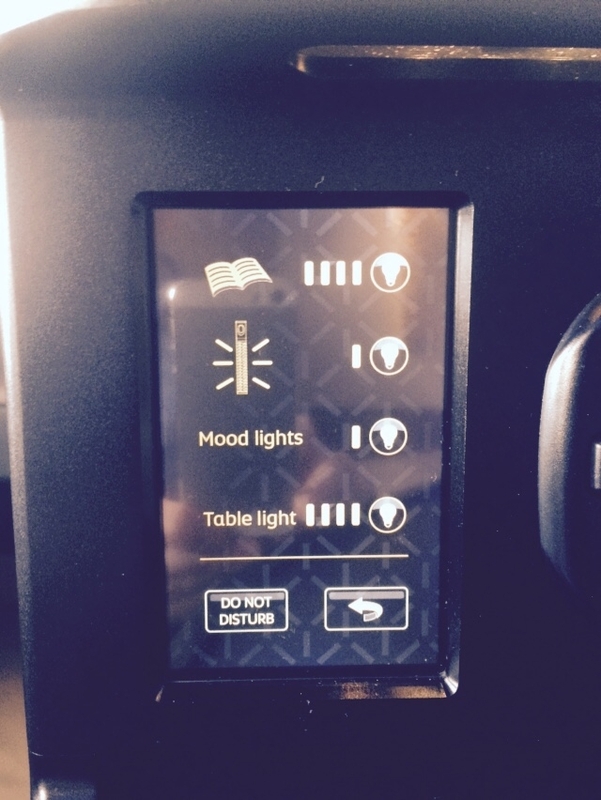 As with Qatar and Emirates, Etihad has a huge IFE selection although I did not spend much time with it. In terms of space and comfort, it is clearly a substantial improvement on BA Club World, especially for the solo traveller. The difference between Emirates A380 and the Qatar 787 / A380 / A350 seat is less clear cut. All Emirates and Qatar seats face forwards which some may prefer. Qatar seats are in a herringbone layout so you are not facing straight forward – but no-one is facing backwards. Having flown all three in the last six months, I would say that the difference between Qatar, Etihad and Emirates business class is minor compared to the gap between the Middle East carriers and the BA offering – as long as you pick the right aircraft type. The Etihad A380 bar is something special as I will show tomorrow. Etihad has a special page on its website devoted to the new Business Studio seat if you want to know more. It is worth touching on service for a minute. The Middle East carriers recruit from across the world. There are a huge number of British cabin crew members working for Emirates, Qatar and Etihad but also a large number of other nationalities. I have found in the past that this can lead to communication difficulties and it is not uncommon for the wrong food or drink to be brought or for crew to struggle to follow an English-language menu. That was not the case with Etihad. There was an exceptionally high level of service from every crew member I dealt with. I have no doubt that Etihad has carefully cherry picked the initial A380 crew members but at the same time I also found the staff in the Heathrow lounge to be very responsive. I did have two issues. The first is that the aircraft did not have any Monday newspapers. On boarding I was offered a copy of FT Weekend (published on Saturday) despite it being 8.45am on Monday! The alternatives were the Sunday papers. This might just about be acceptable for a 6am departure – although first editions are available in London from 10pm the previous night – but for a 9.15am departure it is not acceptable. Etihad is also charging for wi-fi. I know there are capacity issues on aircraft, but I still don’t like to have to pay even if it was ‘just’ $12 for 2 hours. The good news is that there is no data cap – I bought 10MB on Qatar in October and it disappeared very quickly. I have never used the Emirates A380 wi-fi but their website states that 10MB is free and 500MB costs a nominal $1. In Part 2 of this review (click here), I look at the food and drink and the on-board bar, which is a totally different concept from Emirates and Virgin. More photographs from the Etihad A380 can be found on our Instagram feed. Arguably, yes. I’ve never really understood why some people don’t like it. Having done it many times in BA Club World you’re not even aware of it for most of the flight and I often forget that I’m facing towards the back of the plane. 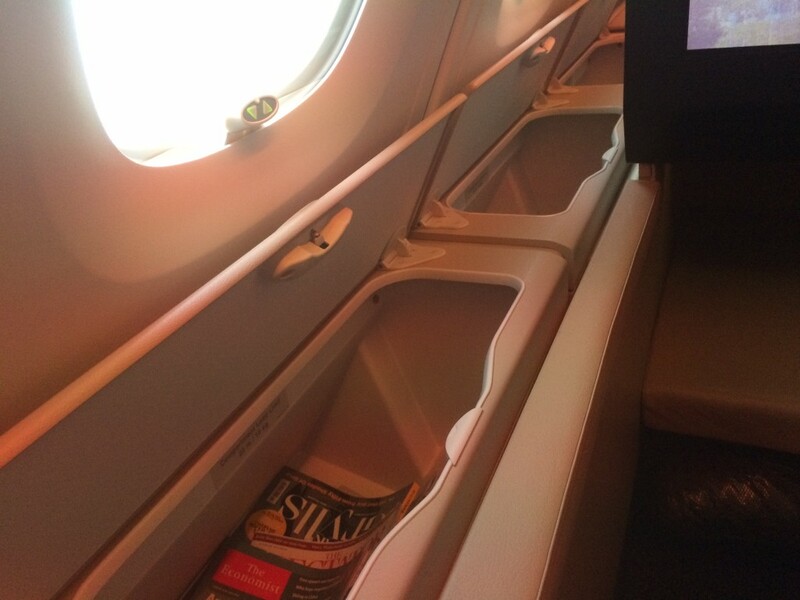 Are the edges and corners on those Etihad seat units as sharp as they look? I wouldn’t want to fall on one in a bit of turbulence. If your plane crashed I think you’re screwed either way …..! A question – is there much of a gap to access the aisle from the window seat or is it a squeeze – not easy to see from online photos ? I have read you need to adjust the seat first. I’d imagine its difficult with the seat reclined. I have to say though it looks like an interesting development on BA’s layout. The seating density must be similar given that BA has 7 abreast on the A380 upper deck / 787 vs 8 here, but cleverly arranged to still provide the width where it is needed, direct aisle access and more side table space. I never made it up as a bed. No problem getting in or out whilst seat set up as a seat. I had the seat reclined to almost a lie flat position, and had to sit it up to be able to get in and out of the window seat. To me, the bed and space seemed as big as a BA F seat, but the cabin layout made it a little tight to get in and out of. A vast improvement over a BA CW seat though. It does seem a lot like BA First, apart from the seat not being totally ‘solo’. Only the fact you are in a large cabin (compared to being in the nose of a 747) is different. How does the cost compare to BA First? Buy in a sale and it is cheap. Mumbai currently £1395 in the sale for eg. The Thales IFE on a BA A380 is the same as the replacement system fitted on many of the 777s a couple of years ago. So still relatively up-to-date in aviation terms, especially compared to the non-AVOD tape loop system that it replaced on the 777s. The 747s and remaining 777s have an older AVOD system from Rockwell Collins. You can certainly tell the difference on the large screens in New F due to the poor resolution. Some of the 747s will be getting an upgrade starting later this year to a new Panasonic system. Just out of interest rob, how did you book this flight? Just over 44,000 one way, although you can make up the remainder with cash (at a reasonable rate as I understand it) if you have 75%. I’m about to do the same, having just opened an Etihad Guest account. Main downside is the 2 year expiry on the miles – am waiting until tomorrow to give us an extra month at least, though I suspect we will use them well before. Etihad has no mileage chart, each route is different. Best to get an Etihad Guest account and do some dummy bookings on the website. Do they ever release more than 2 award seats in business? Not from the UK it seems (perhaps, in time, it will change given how big the A380s are). 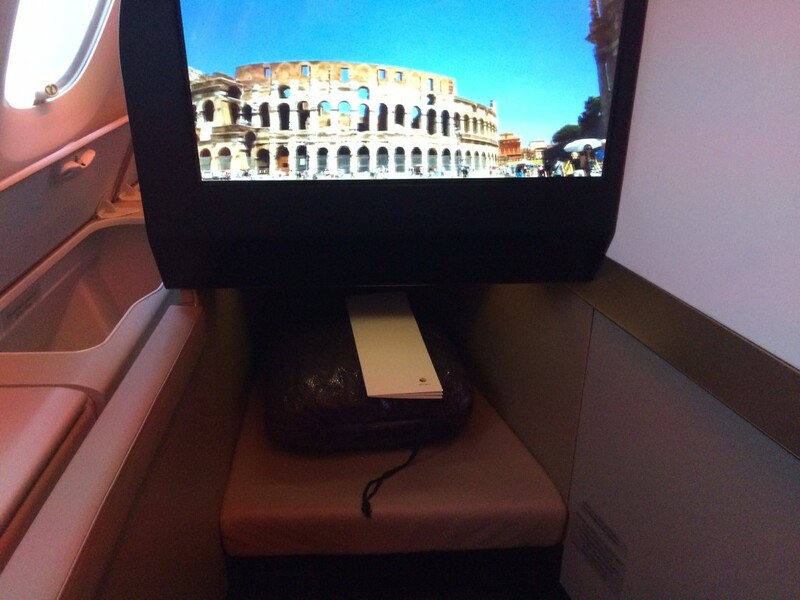 I have been told – but never verified this – that some European departure points do get 4 business class seats. I consider this incredibly stupid behaviour because it alienates the middle ages, successful, business class passenger with a coupe of kids. Ok thanks for the info Rob. I’m finding it quite difficult to plan a trip to NZ for 4 of us in a comfy seat across all the airlines and mileage programs I have points with! Have you looked at SQ? I’ve found their availability pretty good (as SIN is their hub so plenty of flights to/from), although I wasn’t looking for 4 seats! Doesn’t it get a bit cold and the windy if you’re sat directly on the wing? i did the same flight about 10 days before you and there was a code for free wifi in the headphones bag. Easily missed as it is a brown card about the size of a credit card. Pooh 🙂 Never opened headphones. Me! Can’t look at screens all day! Am i right in thinking the saver seats are non refundable once booked? Here’s the thing. The website clearly says NO refund and NO date changes. However, click on ‘Fare Rules’ at the bottom of the right hand margin, once you have selected a flight, and it will show that your flight IS refundable for a 2000 miles penalty. Most people assume that the tickets are not refundable. The fare rules clearly say they are – and these fare rules are repeatedly shown throughout the booking process. As this is Etihad I have struggled to get to the bottom of what is true. I know that someone who booked on the phone was told his ticket was refundable but this was because he had added a tiny amount of cash via the ‘miles and cash’ feature. This seems a very odd reason to swing it. I will look into this more closely. What they told me on the phone was this: the no cancel / no change conditions shown in the flights/fares table apply to redemption bookings. The lengthier fare rules shown in the pop-up via the link over on the right applies to cash tickets. Apparently, if you do a miles-plus-cash booking, even with just £1 in the cash bit, you get the cash fare rules. Only downside is you have to do it by phone (at least, I couldn’t see any way to do it online and the call centre didn’t enlighten me) so you pay a £15 or so booking fee. Might be worth it for flexibility though. Incidentally, I was rather impressed with Etihad’s call centre – one of the better ones in my exerience. That is not true though, because if you read the fare rules that come up they SPECIFICALLY refer to these being the rules for redemption tickets. Excellent find. This matches the fare rules exactly. many thanks mark..interesting you get a free date change, so that’s excellent! are we saying its the same for miles and cash? Yes. Will do an article on miles and cash next week as it is a great deal. I was wondering whether it was a way around the expiry rules. i.e., book something with the ability to change the date for free if doesn’t work or cancel it completely for a small penalty if necessary. I’m assuming in that case that the miles would be good for another 2-3 years (dependent on status level), although that’s not clear. No. It works like Etihad, Lufty etc I think – no way of extending. We’re all fed up of your etihad gushing now. I for one will be very interested to hear about the cash and points options. Where does it say this is an Avios blog?